Here is a fun little craft to make your little girl’s holiday extra special! 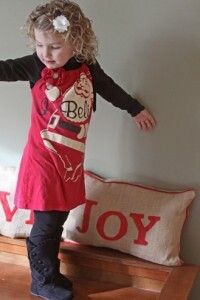 What little lady wouldn’t love a comfy little red dress with a sparkly Santa adorning the front? This comfortable pillowcase style dress was fashioned from an unworn t-shirt in just a few simple steps. The small amount of time that it took me to make this was well worth the effort because my little lady wants to wear it every day! Skip the store bought kids clothes and hit the clearanced out holiday shirts so you can refashion them yourself! Easy, inexpensive, and super cute too. A comfy, fun little dress for any holiday party. 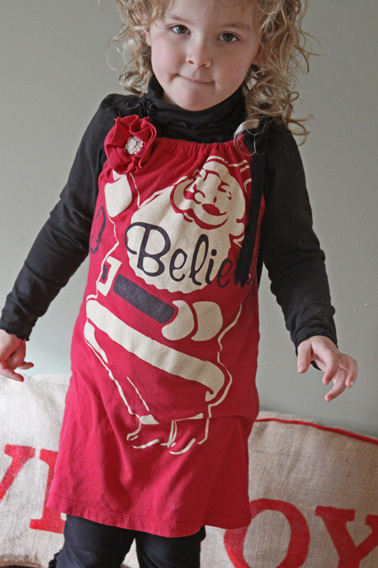 My kids love holiday themed clothes and, to be honest, so do I. There are not a lot of years left with them to celebrate Christmas with the same wonder and enthusiasm, so I really like to make it fun for them. Kid’s clothes can get expensive, and paying big bucks for cute holiday clothes that they will wear for such a short time seems silly to me. Last year I made matching pajamas and Rudolph shirts for the kids, but this year has left me with little time for involved sewing projects. When I pulled this “too small for me t-shirt” out of the Christmas bin this year I knew just what to do with it. 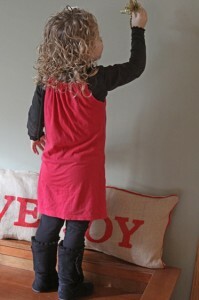 I threw together this little Santa dress for my little lady in about 5 minutes! 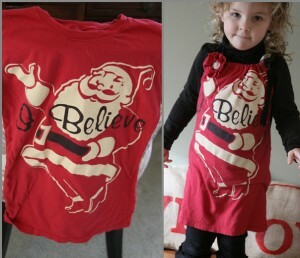 I have had this vintage looking Santa t-shirt for a few years. I got it as a gift and really love it, but sadly it is about 2 sizes to small for me. I get it out every year, and sadly tuck it back in the box after the holidays… hoping, I don’t know, maybe that I would actually fit into it some year. 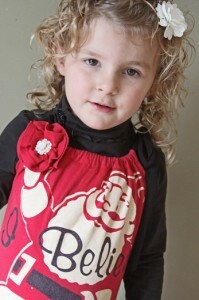 But, I have finally let it go, and decided to make it into a sweet little jersey pillowcase dress for my little lady! Last summer I showed you two tutorials on t-shirt transformations. One was an easy summer dress and the other was t-shirt to tank top transformation. All of these projects use the same simple technique that take very little time. Check out those posts for more detailed instructions. I started with an XS t-shirt (a juniors size I believe) and ended up with the perfect size dress for my daughter who wears a 5T. Because the size of my t-shirt was just right I did not even need to hem the bottom. Now Cut straight across the top of the t-shirt (right under the neckline). I used the sleeves to create the little flower which is attached to the dress with a vintage costume jewelry broach. For more detailed instructions and a picture tutorial check out my other pages! Super quick and easy to create, and so comfy and cute for little ones to sport throughout the holiday season! I was able to use something I had on hand, but hit up the after holiday clearance sales for super cheap t-shirts and then you can go nuts making these for next Christmas! Oh my gosh, Kim, that is so cute!